WUHAN, Nov. 15 (Xinhua) -- Chinese Vice President Wang Qishan on Thursday reiterated the support of more exchanges between Chinese and foreign cities. 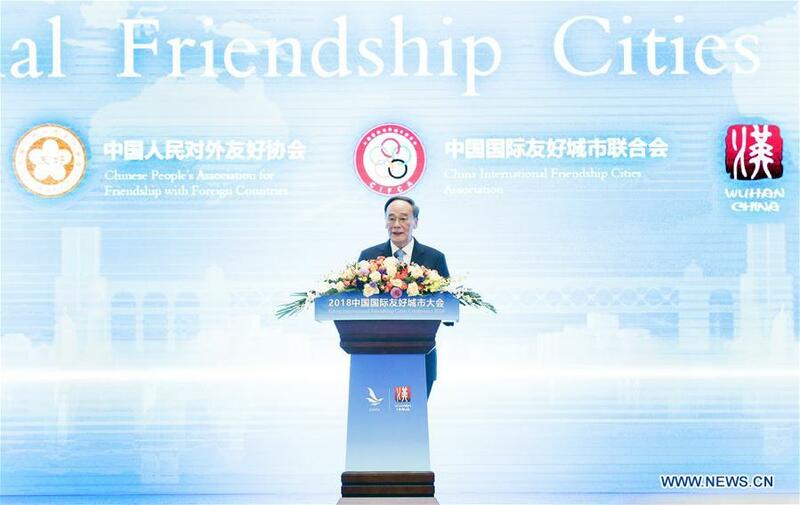 Wang made the remarks in his keynote speech at the opening ceremony of the 2018 China International Friendship Cities Conference held in Wuhan, the capital city of central China's Hubei province. Chinese people are born with the concepts of harmonious co-existence, peaceful cooperation, openness, and inclusiveness, Wang said. With deeply converging interests, China hopes to work with other countries to discover a new interaction model featuring mutual-respect, fairness, justice, and win-win cooperation, so as to propel the building of a shared future for humanity, Wang stressed. He reiterated that the Chinese government supports people-to-people friendly exchanges in various ways and at various levels. "It has been 45 years since China started to foster sister cities. Supported by fruitful cooperation results, local areas have witnessed dramatic social and economic development, as well as increased mutual understanding and friendship among the people," Wang said. With distinct features and complementary advantages, different problems but common challenges, cities have huge potential to advance future cooperation, Wang said, expressing his hope that the delegates will share their wisdom at the conference, reach consensus, and contribute to more active interaction among cities.